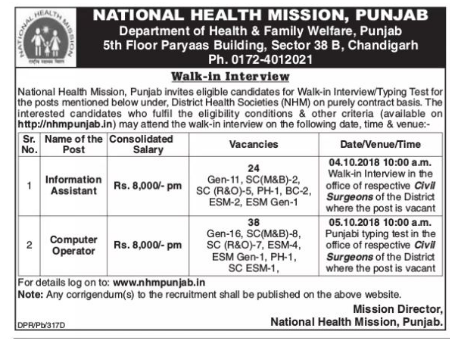 Candidates applying for jobs through NHM Recruitment must not exceed the upper of 35 years as reckoned on 01-08-2018. Information Assistant: Must have passed 12th class with Diploma in Accounting/Commerce trade. Computer Operator: Must have passed 12th class with Diploma in Computer Applications. Candidates who have successfully applied for the desired post at NHM will be assessed on the basis of Typing Test. Candidates seeking possession under NHM Punjab Information Assistant, Computer Operator Recruitment 2018 can refer the official notification.